Let me explain. Price is all about context. Many consumers are loathe to pay for drinking water and rely on water fountains or tap water when feasible. But that large percentage of those same consumers would fork over three bucks for a bottle of water after hours of sightseeing on the humid Washington D.C. Mall in mid-summer. Same is true for housing which is all about location, location, location. Just yesterday, I looked enviously at a a spacious, brand-new house in North Carolina that a friend posted on Facebook that goes for less than half the price of my 80-year old shack in Bethesda, Maryland. In part, price pertains to what the market may bear – in other words, what a potential purchaser is willing to pay. So while lawyers can at least in theory charge $5000 to fill out a form to incorporate a company, they’ll find few takers because competition and ethics rules on reasonable fees keeps prices for legal services in check. Some lawyers contend that price should be set with respect to value. But without data, value isn’t a helpful metric. For example, one could argue that if an entrepreneur wants to incorporate a company that’s destined to become the next Google or Uber, then a $5000 incorporation fee is a drop in the bucket – and offers huge value by protecting a company that will be worth billions. Likewise, estate planning attorneys routinely claim that a $5000 trust is of value because it will save heirs hundreds of thousands of dollars by shielding assets from creditors and avoiding litigation and probate costs. But unless we know how frequently a corporation becomes a Google, or how often an estate is disputed, we can’t accurately comprehend the value of avoiding adverse events. If data shows that estates are disputed in one of twenty cases, and those cases usually involve blended families whereas my family is intact, then there’s less than a 1 in twenty chance that the $5000 spend will accomplish anything so it may be worth taking a chance and going with a cheaper product. Finally, when it comes to price, apples to apples comparisons are important. The lawyer down the block may charge $500 to draft an employment agreement, but with a 2-week turnaround compared to your $1000 fee with a guaranteed 72-hour delivery period. Or maybe your parents hired paid $5000 to hire a lawyer to prepare their estate despite you urging them to use one of your colleagues whose cost was half as much – but who also ran a paperless practice with documents transmitted through a portal and online payment systems that your parents weren’t comfortable using. In addition to being a product of context, pricing also reflects your own personal values and philosophy. Some lawyers want to be the highest priced attorney in town and will charge more than competitors simply for the sake of doing so. Nothing wrong with that either – unless you routinely write off non-payment, so that your quoted rate of $500/hour is more like $350 if you collect only 70 percent of what you bill. Conventional wisdom suggests that if clients don’t complain about your fees, then you’re not charging enough – but personally, I’d rather charge just below premium and collect 100 percent and not have to argue with clients over collections. At the other end of the spectrum, some lawyers strive to make their services affordable – and there’s nothing wrong with that either, so long as you can pay your bills and aren’t going into debt because you’re charging too little. Moreover, hourly rate is also a matter of context: sometimes, an hourly rate will result in a higher overall costs. But there are also attorneys billing at $500/hr who can complete a matter more efficiently and in less time than the $300/hr attorney. (That’s one reason that flat fees make more sense – because they reward experience and efficiency). Ultimately, that’s the most important aspect of pricing services: it’s a matter of how much you want to earn. If you want to earn $75,000 a year, then first, you need to figure out what your total costs will be to get there we’ll assume $30,000). Thus, you need to gross $105,000 or $8750 per month. Then, figure out what it will take to hit that number. Can you find 4 estate planning clients at $2500 each? Or a couple of family law cases where you can bill 35 hours at $250/hr? Can you offer some premium quick turn around services at a higher rate- maybe 24-hour estate plan for $3500 and regular pricing for $2000? 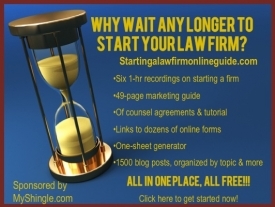 Lawyers always claim that they can’t offer different pricing structures because they’re too difficult to keep track of – which makes me wonder if those same lawyers not take cases with different facts because they’re too difficult to keep track of. Psychology shows that offering clients a menu of options will often lead them to the middle price point rather than the lowest cost choice. So to loop back around to the opening question, how much should lawyers charge for their services? Whatever they want. And to figure out what you want to charge, don’t look at what everyone else is doing – because competing on price, whether you’re at the top of the market or the bottom, is a recipe for disaster. Instead, keep experimenting until you come up with numbers that work for you. Upcounsel (rate information for trademarks and other small business matters).